mash has no good reputation. Porridge, you eat as a child and later, if you're unlucky, in the case of illness or old teeth. Nevertheless, I highly recommend a rice porridge, the cards under the name of Congee can be found on Chinese dining, spoken Kondschi. He deserves to be known to us, for attention: He makes you rich. The dish is popular from Japan, China and Southeast Asia to India. And because for thousands of years is so, must be something to it. The preparation is very simple. I give 1 Cup glutinous rice (130 g in weight, 150 ml in volume) in a saucepan, add the twelve-fold amount of water, cook briefly, turn off then on the weakest possible heat level down, put on the lid so that the steam can escape, and let sources. How long is it? An hour is almost no matter, at least, easily two. Because of the rice dissolves during the time anyway, cloudy, dazzling totally, I don't need to guard him. It's as easy. I encountered Congee, as I polishing in Vancouver for eleven dollars an hour at police headquarters the night shift brass brushed (in North America and flaunt sovereign building with brass – authorities signs, doors and stair railing are a matter of day-to-day, or better yet, at night, to a high gloss). Lunch for me was around two o'clock in the morning, and in the nightlife of the nearby Chinese quarter, where I ate was Congee all the rage. At the time, I still pulled noodle soups, porridge I was a little suspect. But as I attended the 2014 Vancouver again, I discovered at a Chinese Congee on the map, and ordered him full of curiosity. This is for sure one of the reasons for the tremendous and eternal popularity of the court. It saturates, it does so long-lasting and cost virtually nothing. Therefore, Congee makes you rich! According to Henry Ford's dictum, namely, that it is not by the money rich, you earned, but by what it spends. With Congee you live in crazy economical. That should pull in a society of bargain hunters and chintzy, which miserliness is regarded as a cool, but comfortable. 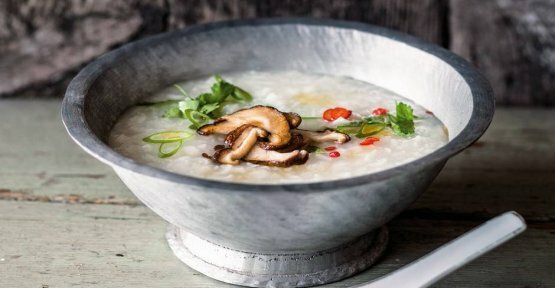 How cheap you can eat with Congee for a long time, was attributed to: 1 Kilo glutinous rice costs about 3 euros (a 20-Kilo bag, by the way, 50 euros). 12 parts water to 1 part rice initially appears to be impossible for a lot of, but that's true and proves how crazy high the water absorption capacity of glutinous rice. From 1 bowl of rice, 130 g in weight and in value from 40 cents at the use of 12 x 150 ml of water, 1.8 liters of Congee. The saturates four people! But why calculate? we Think short. The world is increasingly full of lunatic? You is it. It is not excluded that dark hackers shut down the power supply of Metropolitan areas, and our deep freezer melt the rest? It is not. Can it hurt to provide a little probable, but not impossible emergency with indestructible food? It can't hurt, no. This is not a Preppertum, this is a healthy skepticism combined with common sense and Care. You can. when you cook the rice also, ginger squeezed the root, the White of 1 spring onion and 1 chicken leg mitgaren, the ginger and discard, the leg meat zerzupfen and back in the rice porridge and minced onion green! Cut into strips of cold or hot smoked "stremel" salmon is a real charm, like a pair of colorful diced chard is just as stems.